ChrissyAi: Followers to Friends Blog Hop! Followers to Friends Blog Hop! Thanks for co-hosting the linky party! So glad I finally found a fun blog hop on Wednesday! New follower. Looking forward to your posts! I was happy to! Me too, this is only the second blog hop I've been in, it's so much fun and so easy to find other bloggers this way! I think it happens when you go to my blog through chrissyai.blogspot.com it's doing that for some weird reason after I bought a domain. If you enter through chrissyai.com it should work fine. (: Thank you! hi! thanks for hosting! love the blog! would love to know how you set up your instagram/twitter/etc widgets like that! any help would be great! thanks so much! Of course! If you go to SnapWidget.com and 'Get Started' it has everything you need to fill out there for the instagram picture set up, it's quick and easy. It basically does everything for you. Thanks for co-hosting on such short notice, you're a gem! Thanks for cohosting! I think I am your 100th follower. :) you have a lovely blog! Yay! I'll have to include you when I do my 100 Followers post! Hehe. Yay for 101! Haha. Thank you for following, I've followed you back. (: I love how your blog is set up! Yay for new followers, haha! Speaking of, I've followed you back! I'm following from the blog hop, thanks for co-hosting! I'm excited to look around and get to know you, have a great day! Of course, thanks for being a part of the blog hop! Your blog looks lovely! Hey, co-host! I'm a new follower! You've got some cute stuff here, I can't wait to check it all out! Joining in on the fun of the blog party. I for some reason could not follow you on GFC but I followed you on bloglovin. Yay! I think it's because the link may be directed at chrissyai.blogspot.com instead of chrissyai.com and it's causing something to mess up. Thank you, I hope it works next time you visit! Thank you for hosting! New follower! I love the idea of followers to friends! Of course, thank you for joining! Me too! Great blog hop! New follower. Thanks for joining! Your blog is lovely! 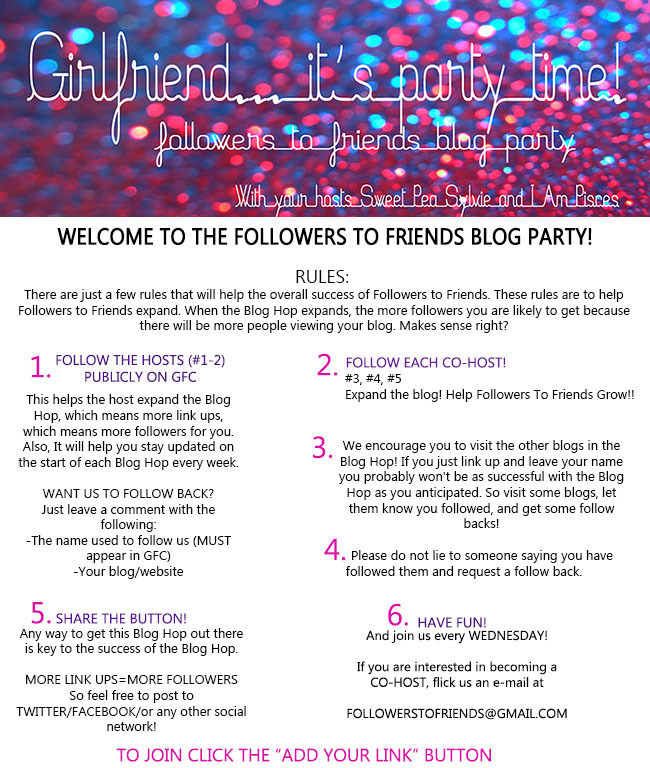 Stopping by from the Followers to Friends Blog Party :) Thanks for co-hosting! You have a cute blog. Oh, and I followed you via GFC! Yay! Of course, I was happy to. Thanks for joining! LOVE JUICY! See you do too! Found ya thru the Followers to Friends hop! Happy New Follower! Fun hop! I'm your newest follower and have linked up with the blog hop. I'd love for you to stop by.